Nagaland has been honoured with the ‘Best Eri Silk Producing State’ award by Union minister of External Affairs Sushma Swaraj at a mega silk event – Surging Silk – in New Delhi on Saturday. 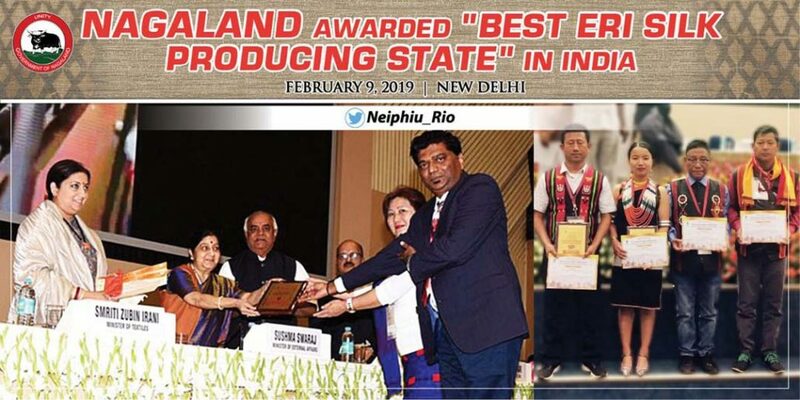 Informing about it on his Twitter handle, Nagaland Chief Minister Neiphiu Rio on Sunday stated that the award has been conferred on Nagaland for its contributions to the overall development of the sericulture and silk industry in the country. Earlier, informing about the selection of Nagaland to be the ‘Best Eri Silk Producing State’ in India, Nagaland Chief Minister Rio through his Twitter handle on February 5, 2019 had congratulated the staff members of the department of Sericulture. Speaking on the occasion, Union External Affairs minister Swaraj on Saturday assured that the textiles ministry would provide all support for promoting silk in global markets. Union minister Swaraj also said silk is a strong commodity and there is huge demand for it in the international markets. Union Textiles minister Smriti Zubin Irani, while speaking at the function, said that silk production has increased by 41 per cent since 2013-14. During the event, best achievers in silk industry across various segments of sericulture in the country were honoured and awards were also given to the best performing states. According to reports, a mobile application was also launched for quality certification in silkworm seed sector. India’s silk production capacity is expected to reach about 38,500 tonnes by 2020 from the current level of 32,000 tonnes, say reports.